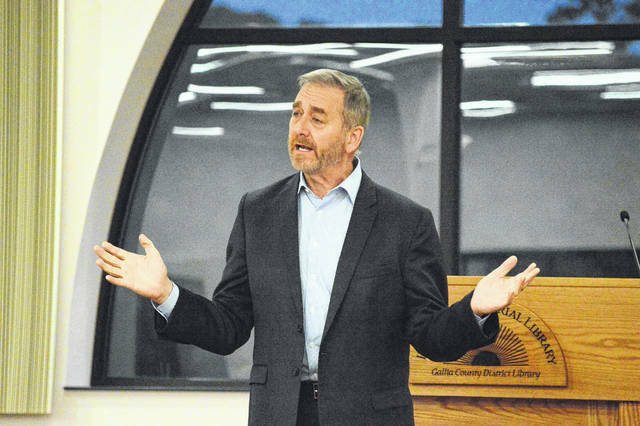 Ohio Auditor Dave Yost serves as a keynote speaker at the Gallia GOP Rally Tuesday evening. GALLIPOLIS — The Gallia County GOP Party gathered Tuesday for an evening of food, fellowship and looking forward to the future of both the state and the county. Ohio Auditor Dave Yost and Ohio Senator Frank LaRose both served as speakers at the rally. Yost is running for Ohio Attorney General and LaRose has his eye set on the Ohio Secretary of State chair. Rally attendants listened to music performed by the Gallia Academy High School Band. Yost credited his office with 140 individuals and counting who had been convicted of criminal offenses while in office. According to information provided by the Gallia Republican Party, Yost began his career as an award-wining newspaper reporter for the Columbus Citizen-Journal and later practiced law with Burkam, Yost and Fuller in Delaware, before serving on city council and becoming the county auditor. He served for eight years as the elected prosecutor for Delaware County, winning the first capital murder case in the county’s history and claims to have taken down the county’s largest crime ring. Yost has served as Ohio’s 32nd auditor. The auditor says his priorities will be to focus on human trafficking, the opioid epidemic and supporting law enforcement officers in the performance of their duties, if he is elected attorney general. Yost thanked Gallia for its hospitality and asked residents to consider voting for him. Information pertaining to LaRose will follow in a later edition of the Gallipolis Daily Tribune.